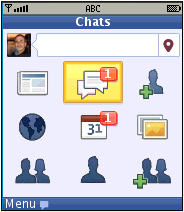 The newest version of the Facebook app. It’s supposed to be faster than previous versions but there doesn’t seem to be anything else new since Facebook 2.9.1. This is an unsigned version that’s optimized for the LG Rumor Reflex but works on many other touchscreen and non-touchscreen phones. If It doesn’t work on your phone try downloading the app directly from Facebook at http://d.fb.me/3ux using your phone’s browser. WHICH VERSION OF FB SUPPORTED ON ITEL IT5238?PLZ HELP..I NEED IT. Why are you YELLING? We are all friendly, peaceful people here. I have no idea which version of Facebook, if any works, on the Itel IT5238. I’ve never seen or heard of that phone. If the one on this page doesn’t and you are sure the phone supports Java ME try downloading the app directly from Facebook at http://d.fb.me/3ux using your phone’s browser. What’s a MIDled file and what’s wrong with it? How can i download the application execution file on desktop then copy into my Qmobile E750…. if i do it will work? You can download the jad and jar files to your PC using the links at the bottom of this post. Then copy the jad and jar to your phone’s memory card using USB cable or a memory card reader/writer. Use the phone’s file manager or My Files app to open the jad file. I’m not familiar with the Qmobile E750 but on most phones this will install the app. I have no idea if it will work on this phone or not. Sorry, but I don’t have that version and it’s no longer on the Facebook site so I have no way of getting it. My micromax x337 does not support any java,jar or jad file..Is there any way to download fb app. on my mobile.thnx! If your phone doesn’t support Java the Facebook apps on this site won’t work. You may be able to use the Facebook Website in the phone’s browser. Try downloading the Facebook app directly from Facebook by going to http://d.facebook.com/fbapp/d/facebook.jad with your phone’s browser. If that doesn’t work nothing will. Spoke too soon.starts and runs first time ONLY. Got it downloaded on Motorola Theory, but buttons don’t work to log in. Nevermind, i used an alternative download from the Facebook. Authorization failed, on my Nokia 5320.